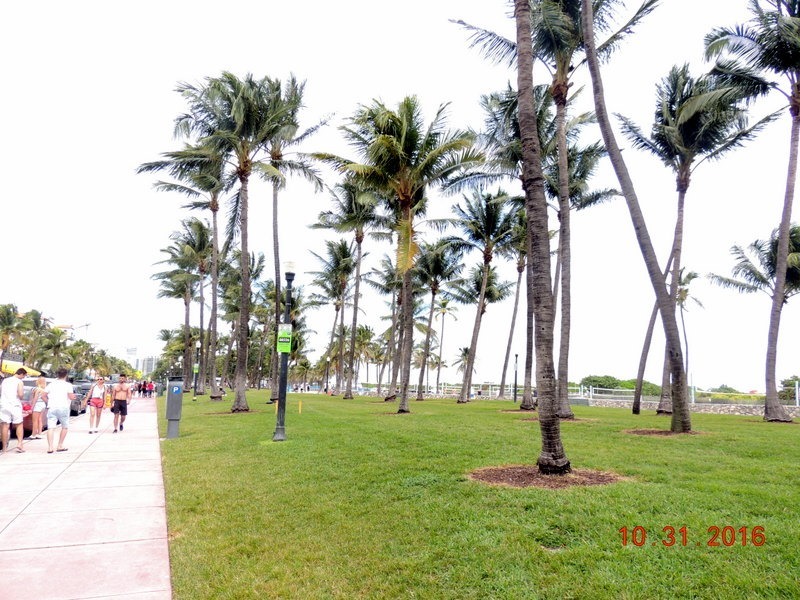 Saturday- We left early and drove north to Ft. Lauderdale. Traffic was not as bad today. It was the first day it has been tolerable! It was not a great beach day. 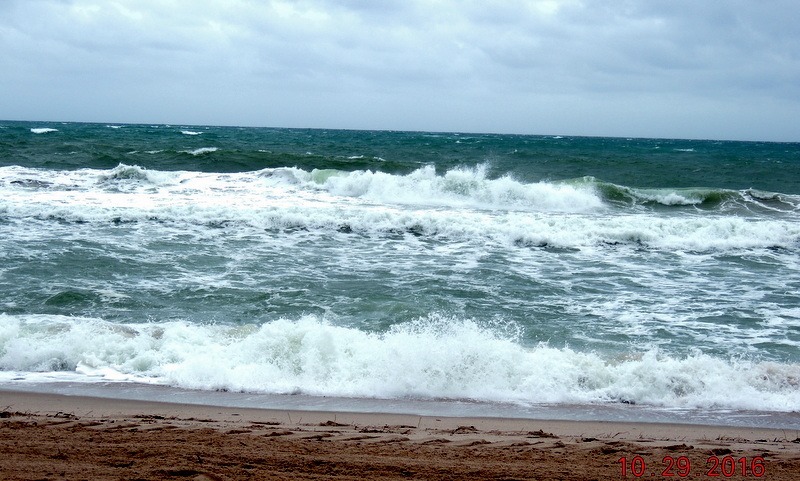 The wind was strong and the waves were rough! The red warning flags were up, and sensibly, no one was in the water. We drove north along the beach, looking at the buildings and the people walking along. We left the beach and went inland to drive through the older area of the city. We went to lunch at the Floridian, sitting outside eating. The food was okay, but I would not recommend the restaurant. We left and returned to the MH, and settled in for the evening. Sunday- The Redskins were in London playing this week, so the game was at 9:30 AM. Kind of neat to see them play the National Anthem, then God Save the Queen! After lunch, and the end of the overtime game, we drove south to Homestead. The guide books said to go to Old Town. We did and were not impressed. They had an old movie theater and a plaque talking about the old city hall. We have seen much more impressive areas. We left and went to the outlet mall, then returned to the MH. We ate dinner at home, watched TV, read and went to bed. 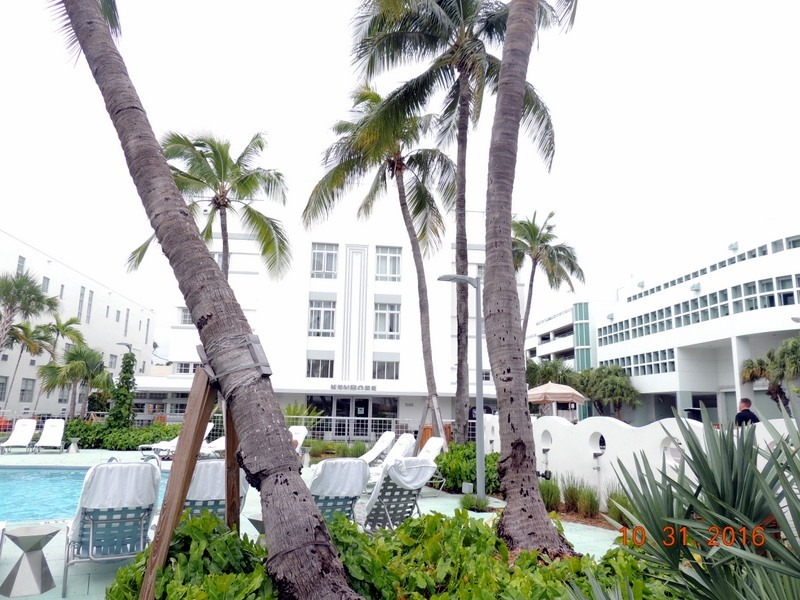 Monday- We left and drove north to Miami Beach. We left after rush hour, but traffic was still awful. 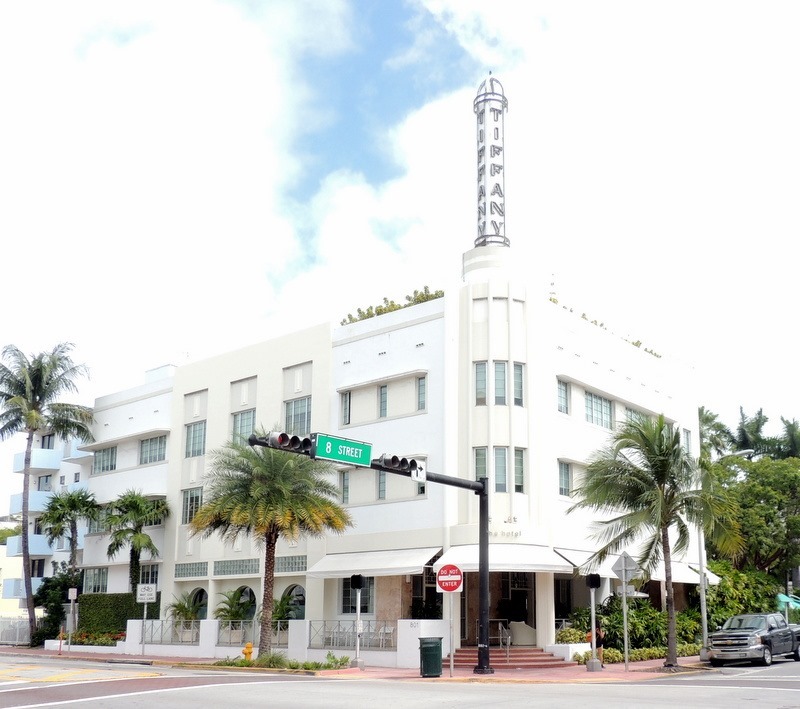 We wanted to take the 10:30 Art Deco tour, but could not find a parking place. By the time we found a parking place, it was 10:45. So we signed up for the self tour. It was $15 each, senior rate. We were each given a small I-pod. We walked the hour long tour of the various buildings. It was very interesting and I think we enjoyed it more than we would have the guided tour, as we could move at our own pace. You are allowed to enter all of the buildings except the first one. 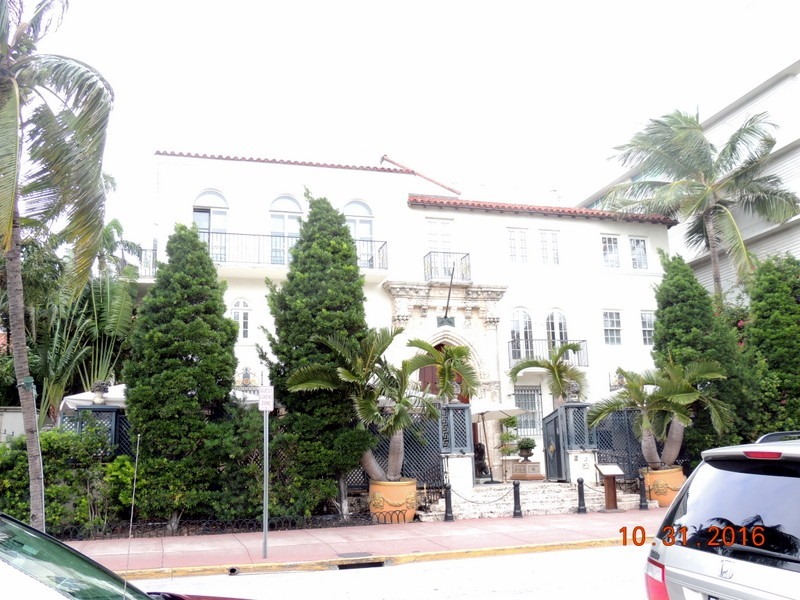 This is the Versace House, where he was killed. It is now a very expensive restaurant. There is a large courtyard inside which you can see through this picture. There are 14 buildings on the tour. 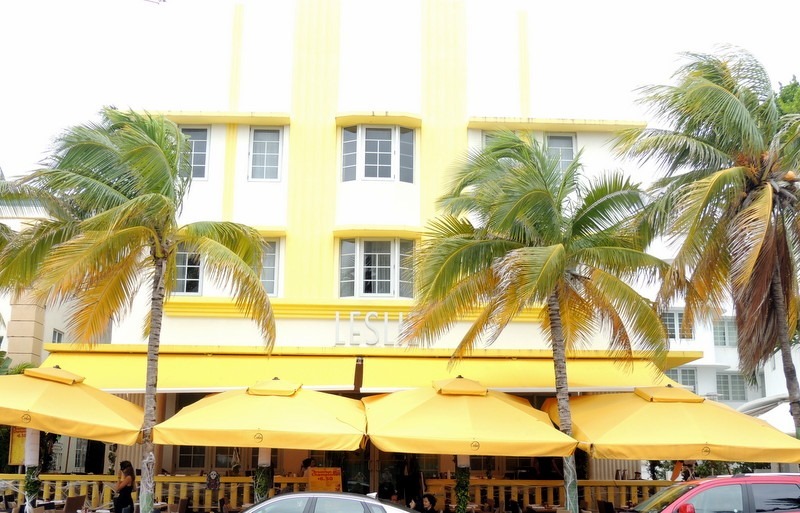 This is The Leslie. 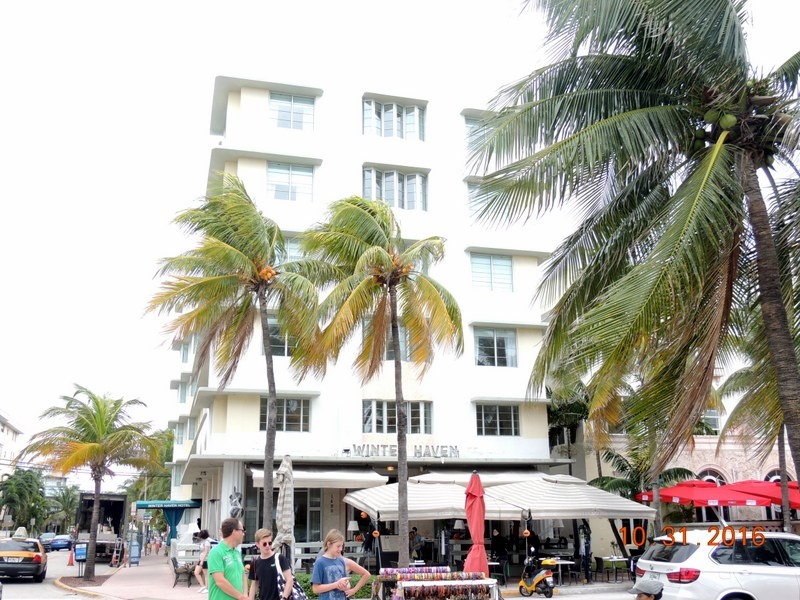 Most of the buildings on the ocean front road have restaurants in on the first floor and are hotels. Because it is Halloween, the staff at each restaurant were dressed in costume. They were very annoying, as they kept pushing the menu’s at you to get you to stop in and eat a meal. We moved to walking on the other side of the street. If you look carefully at both the pictures above, you can see some of the style points. The three columns in the center, the rounded corners and windows, and the eyebrows, which are over each of the windows. These are themes for many of the buildings. 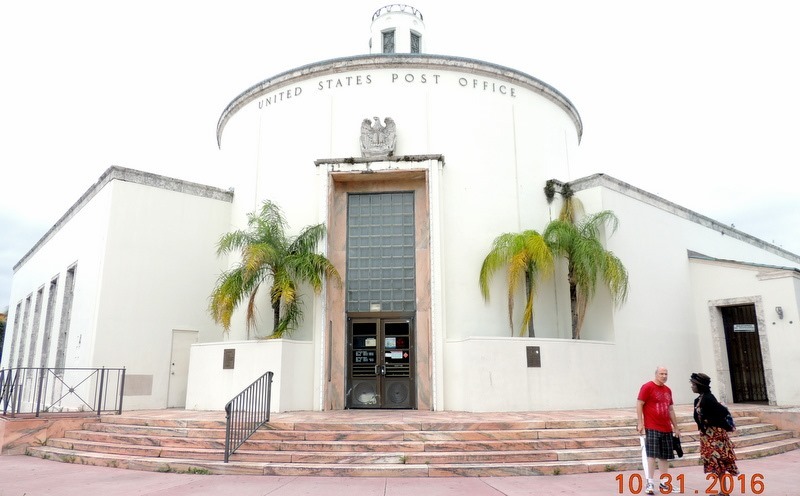 We did not enter most of the buildings, but we did go into the Post Office. 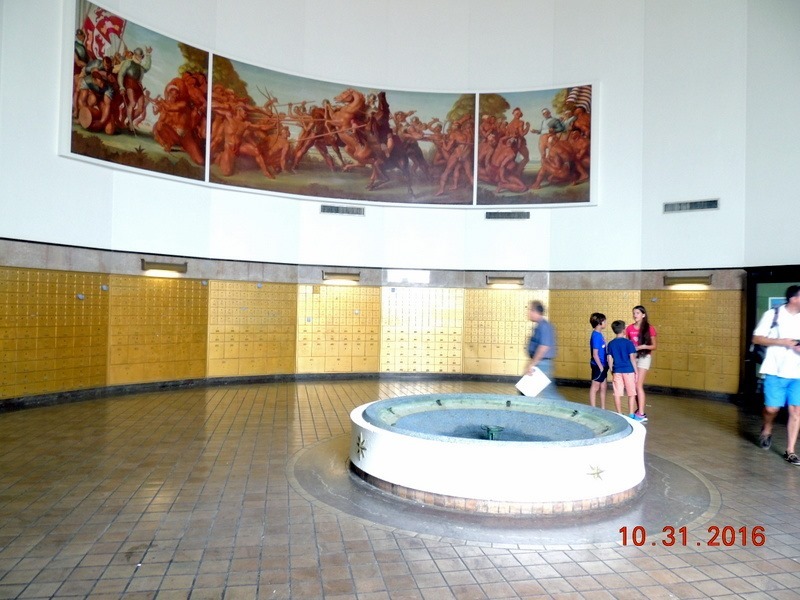 Below are the bronze mail boxes, the three part mural and to the right is the ceiling. As we walked past the police department, we saw this car in front and thought it was interesting. 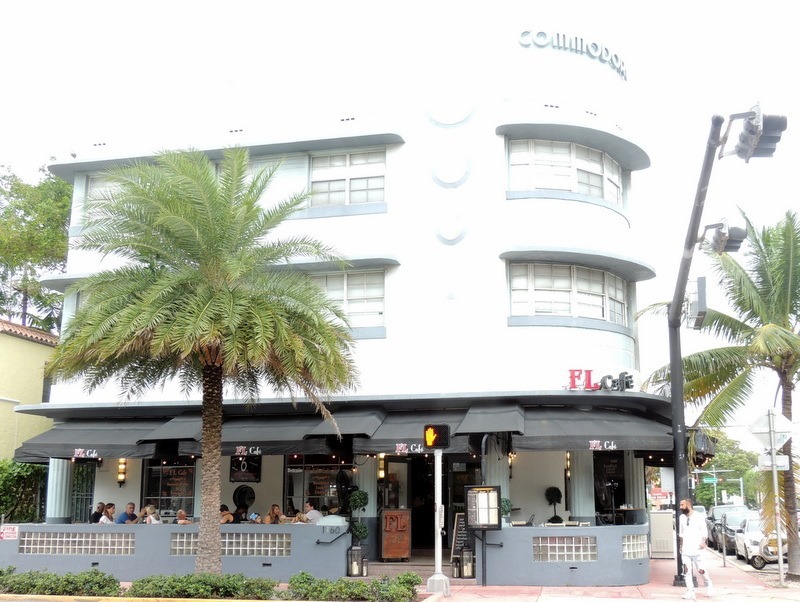 Below is the 11th street Diner. It was brought from New Jersey and placed here in the 1950’s. Above is the original city hall. Above, there were three hotels in a row which were identical. 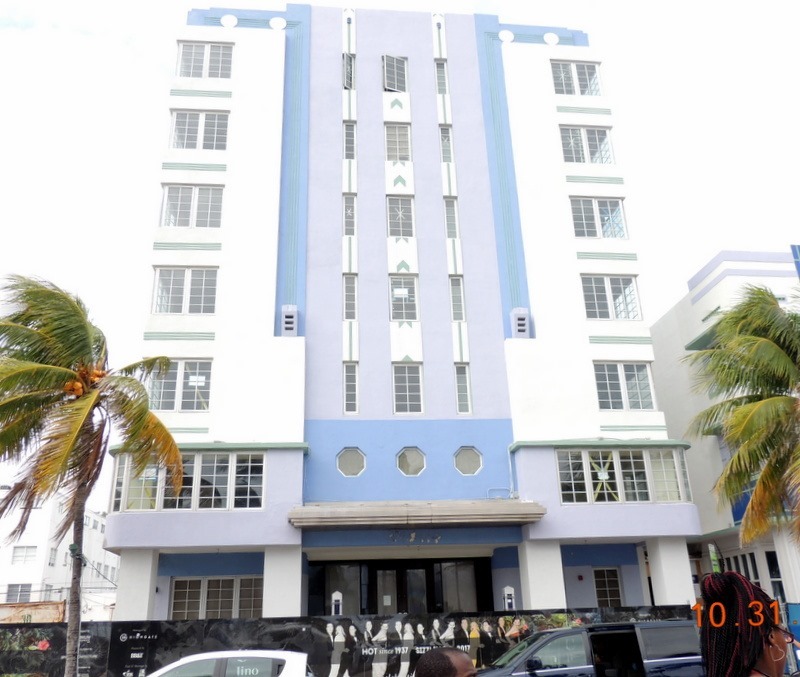 Above, this building, the Blackstone, was originally two stories. It was storage for the rich folks valuables when they were not in town. It was added onto three times, building up, to keep up with the demand for storage space. 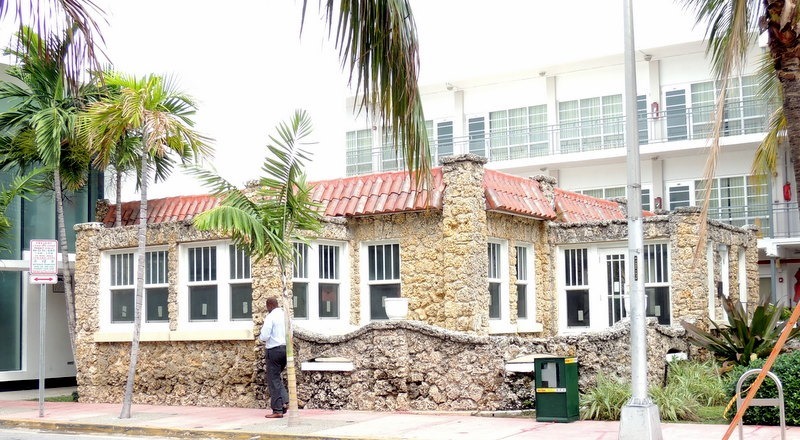 Above is the Coral Rock House, an example of the homes built with the coral from the area. It is currently a restaurant. Below is the Sherbrook. If you look at the picture on the right, you can see that the corner of the building looks like the ‘rockets’ from the early movies. 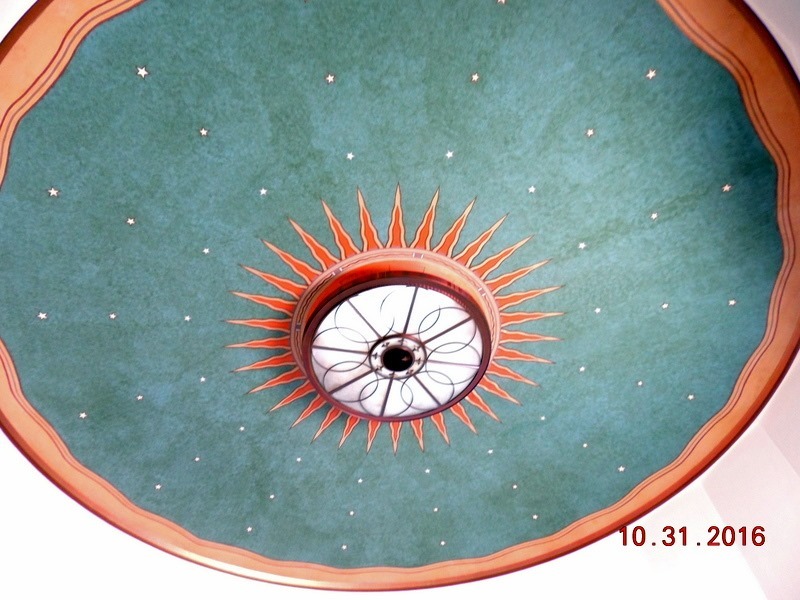 Above is the Tiffany. Note the colors. The architect of this building had it painted in these pastels. 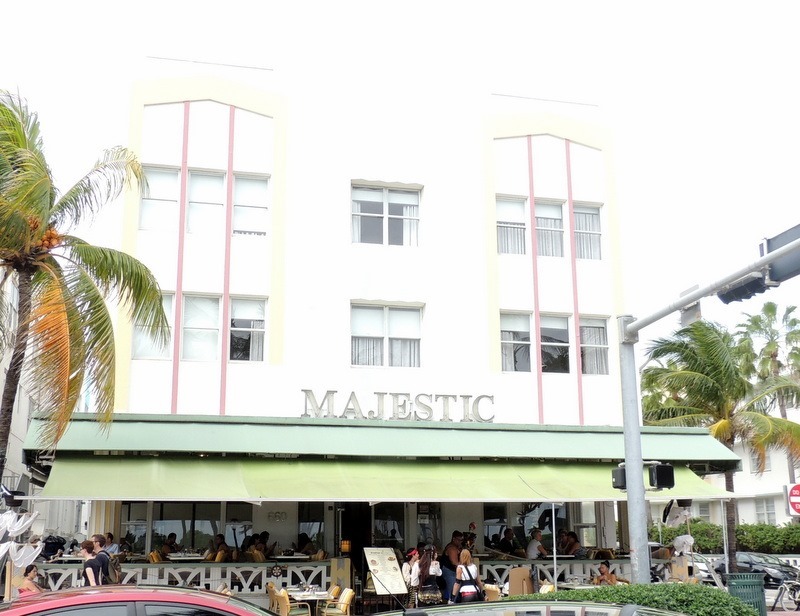 He then developed a palate of 28 pastel colors; the palate was adopted by the City Council and these are the only 28 colors that can be used in Miami Beach. 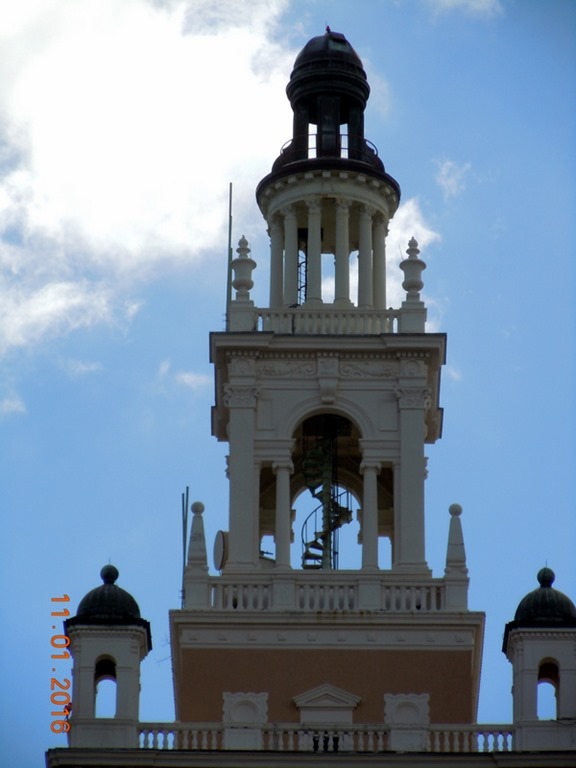 Above is the Waldorf Tower, which is the last building on the tour. 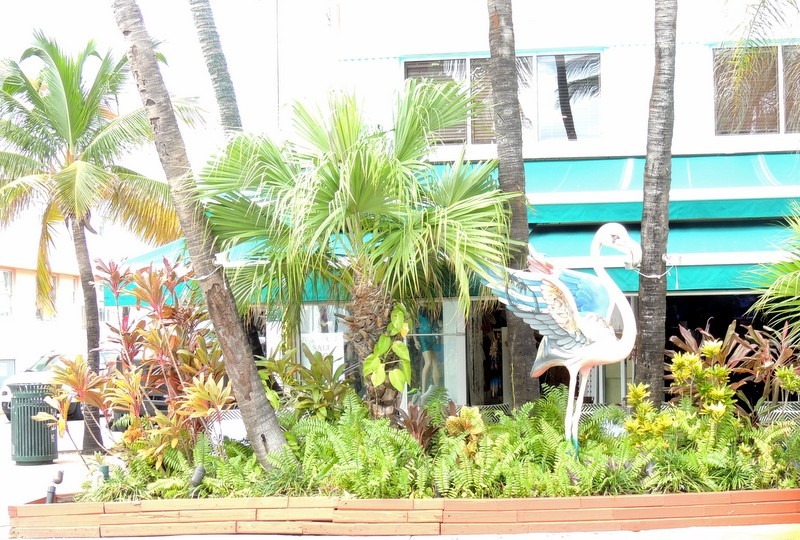 But of course, if you are in Miami, you have to see a flamingo! We left and went to lunch at Joes Stone Crab. The restaurant was closed, but the ‘take away’ was open. We purchased crab rolls and a bowl of She Crab soup to split. We did not realize that the crab was a salad and full of bell pepper! So Bob ate the soup and I had my crab roll for lunch and his for dinner. They have seating at the ‘take away’, like in a fast food restaurant. 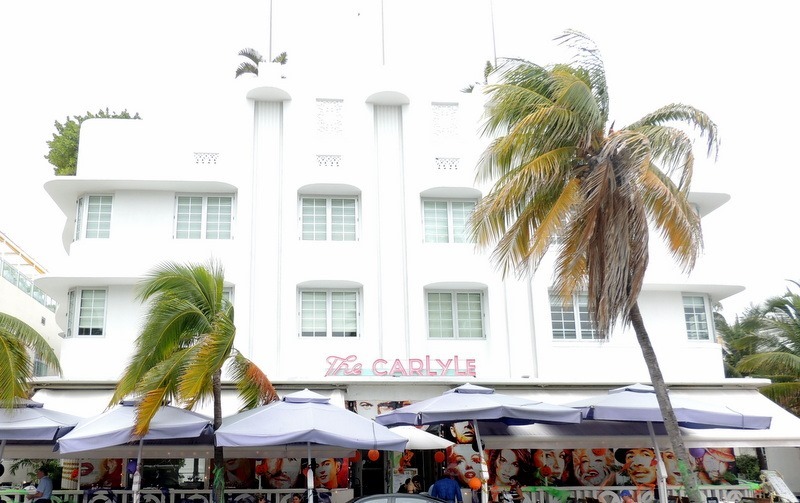 We left and drove north to North Miami Beach. Our destination was The Ancient Spanish Monastery. We entered the Visitor Center where we paid $5 each, senior rate. The construction of the Monastery and Cloister of St. Bernard de Clairvaux began in Sacramenia Spain in 1122. That is nearly 360 years before Columbus set sail for the New World!! It was completed in 1142 AD and originally dedicated to the Virgin Mary and named the Monastery of “Our Lady, Queen of the Angels”. 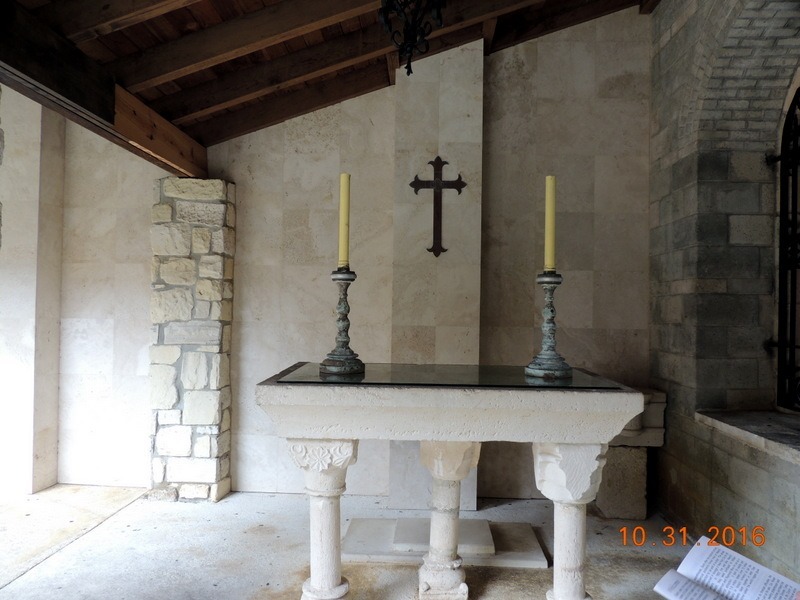 When St. Bernard de Clairvaux, a monk, was canonized, the monastery was renamed for him. 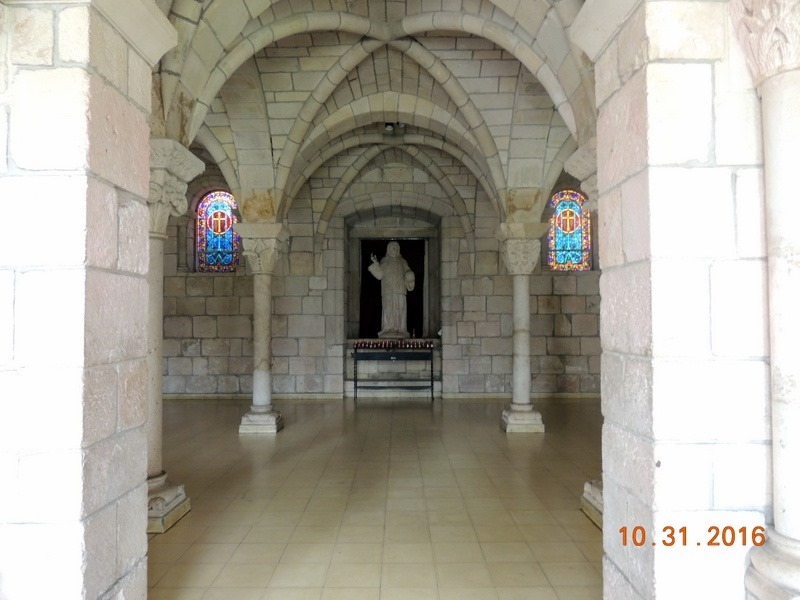 The Cistercian monks occupied the monastery for nearly 700 years. After a social revolution in the 1830’s the Cloisters were seized, sold, and converted into a granary and stable. 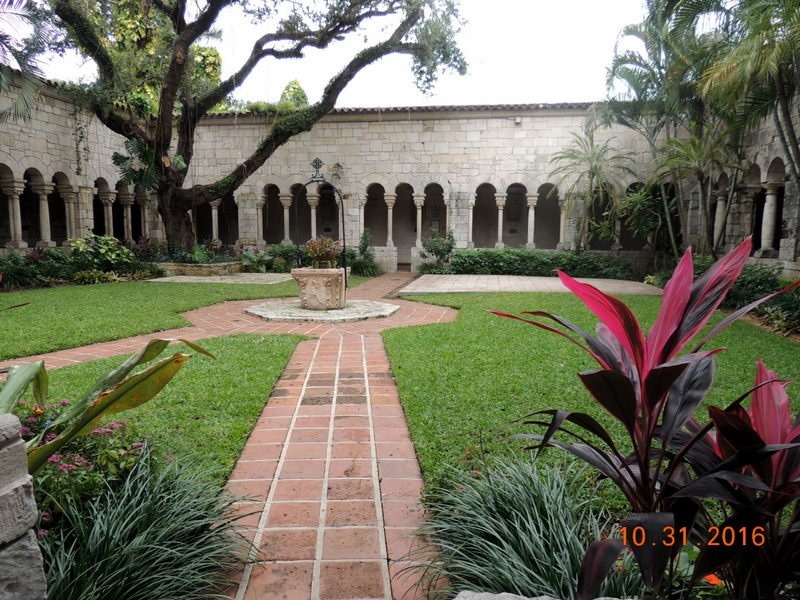 In 1925, William Randolph Hearst purchased the Cloisters and the Monastery’s out buildings. The structures were dismantled stone by stone, bound in protective hay, and packed in 11,000 numbered wooden crates, and shipped to the USA. At about that time there was an outbreak of hoof and mouth disease in Segovia and the US Dept. of Agriculture quarantined the shipment. They broke open the crates and burned the hay. The workers failed to replace the stones in their original numbered boxes before moving them to a warehouse. Due to financial difficulties, Hearst’s assets were sold at auction. The stones remained in New York City for 26 years, before being purchased by William Edgemont and Raymond Moss for use as a tourist attraction. It took 19 months and over 1.5 million dollars ( over 13 million in today’s dollars) to put the Cloisters back together in what Time Magazine called ‘the biggest jigsaw puzzle’. 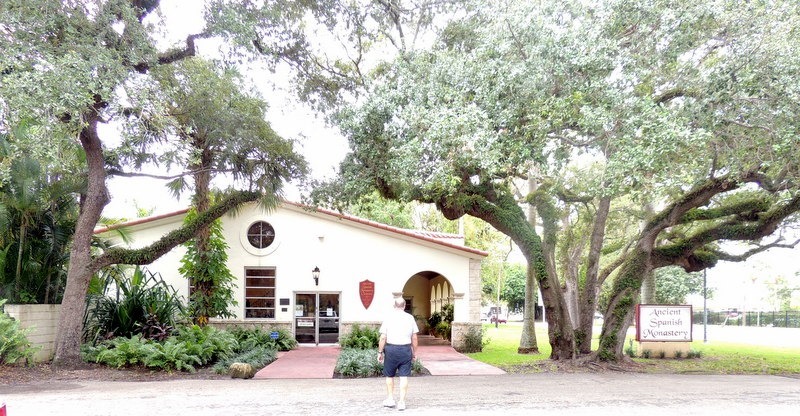 In 1964 the buildings were put up for sale and Col. Robert Pentland, Jr, purchased the Monastery. 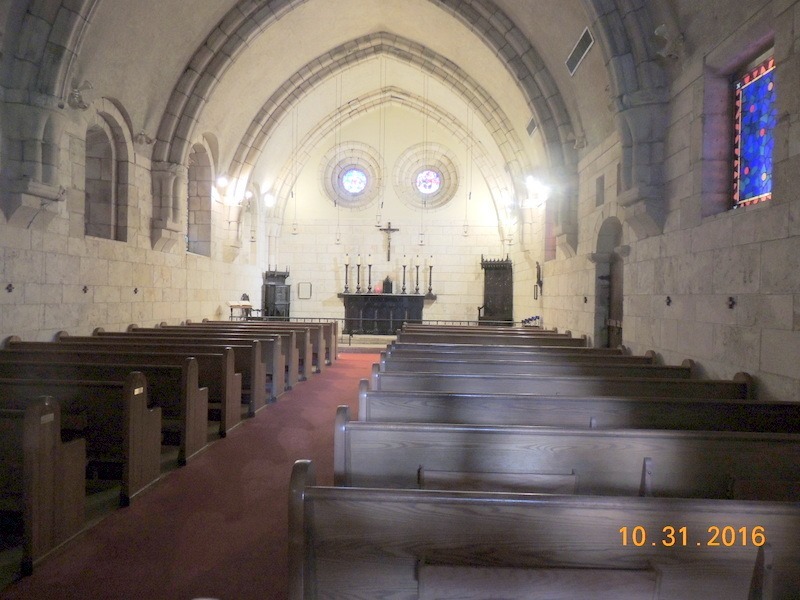 At this point it became a working Episcopal congregation and services are still held here today. It is also a popular place for weddings. Below is a Hymnarium, a Hymnal. 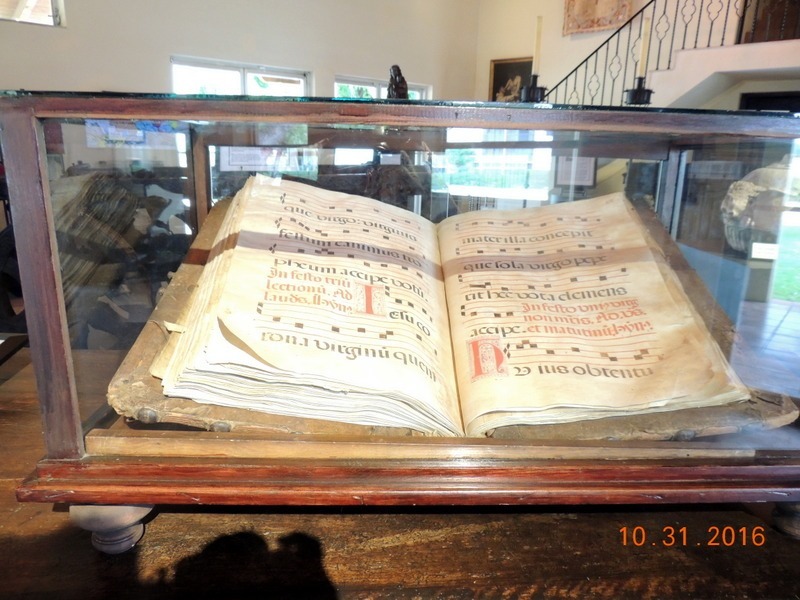 It is over 800 years old and was hand painted on lambskin parchment. Juices of berries were used by the monks as ink. 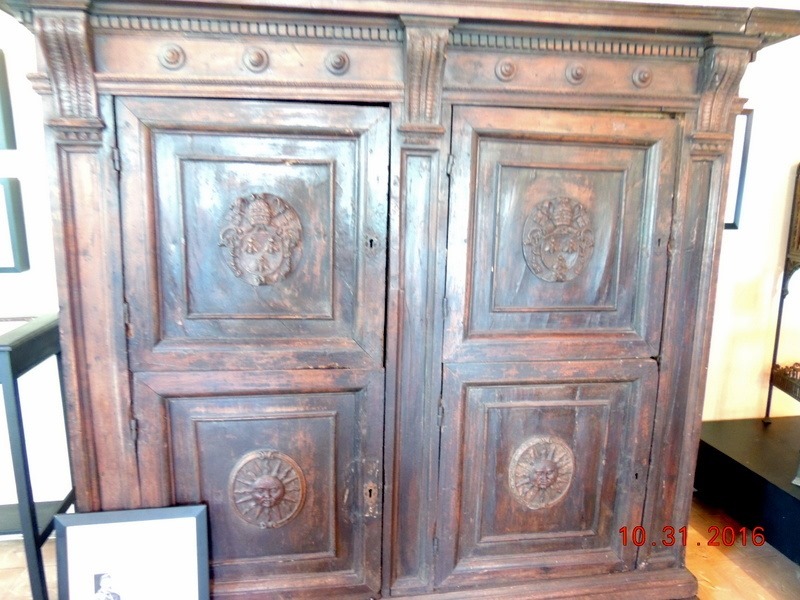 Above is a rare corner cabinet from the 1500’s. Above is the” Pope’s Cabinet”. 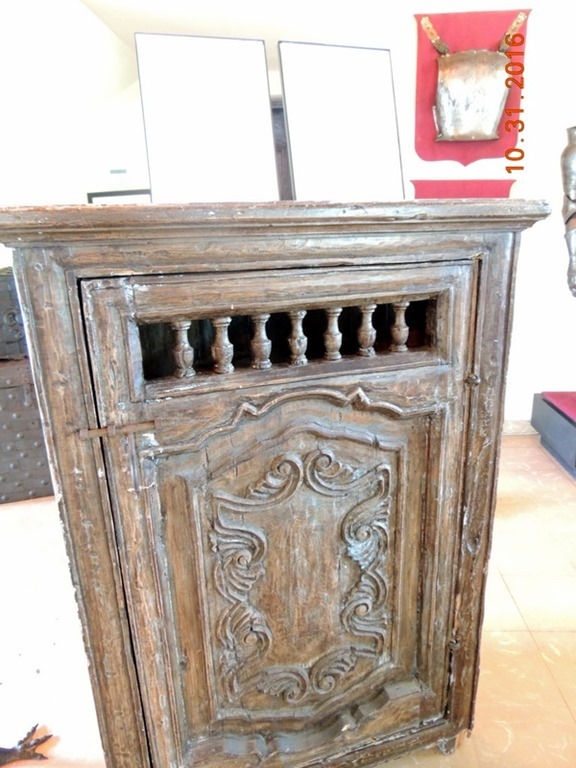 This hand-carved walnut cabinet was used by Pope Urban VII ( 1644-1652) to store his personal clothing. It is decorated with the Papal Seal and the Bernini family crest, three honeybees and the sun. Note in the picture above, there is a cat. This was one of about 10 that we saw during our visit. We entered thru the door straight ahead, and into the courtyard. We left and returned south, traveling through crazy traffic, with people acting like maniacs. I prefer driving in LA than Miami! At least is LA people were much more polite! We stopped at the hospital to pick up Bob’s medical record. The exit from the Florida Turnpike was a parking lot! We moved into the right ,left turn lane. A cop car and a motorcycle cop drove down the right lane and turned left in front of everyone. We commented that we guessed they can get away with that. We turned into the hospital driveway and noticed that the entire area was covered in “Cop”. We immediately knew that a cop had been injured or killed. We found out later, on the news, that a motorcycle cop had been killed in a vehicle accident while on the way to work. We picked up Bob’s medical record and returned home, stopping at Costco on the way to get more gas, $2.17/gal. 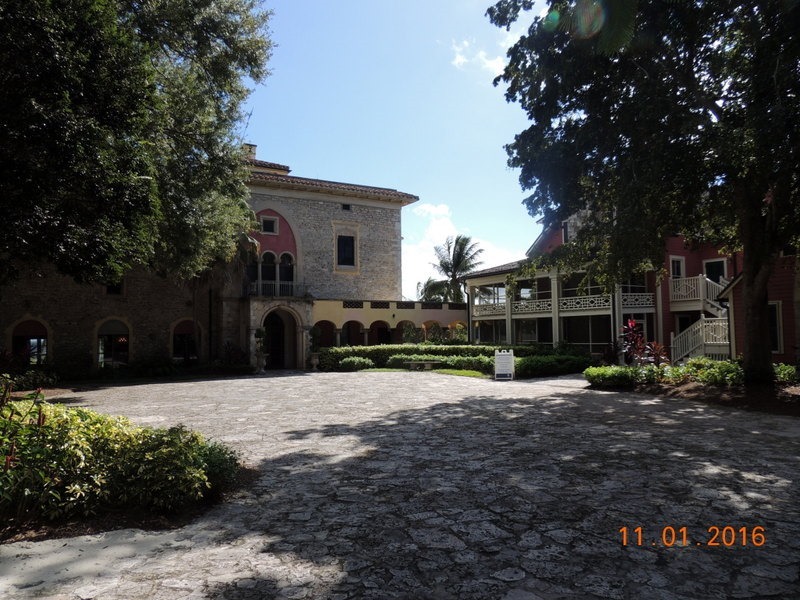 Tuesday- We left a little bit later, around 9:30 and traveled to The Charles Deering Estate. 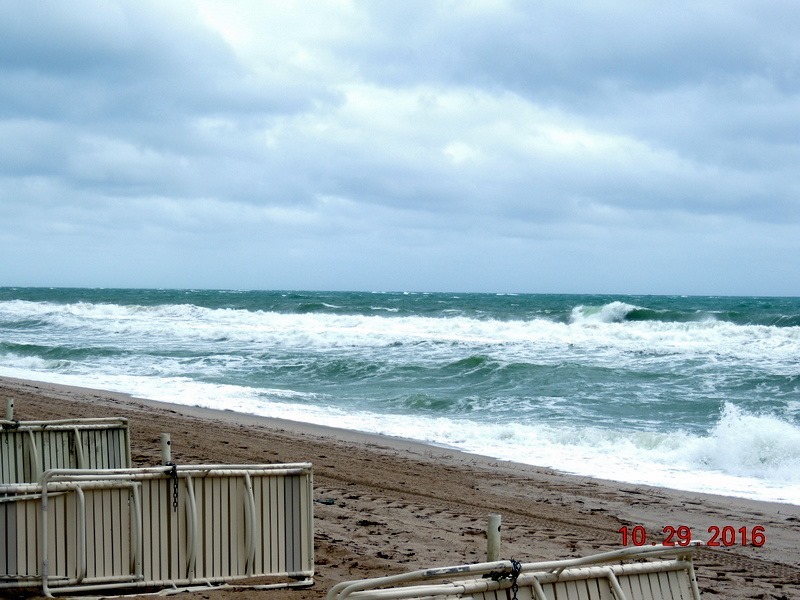 When Henry Flagler built the railroad to the Keys, he ran past this area, not too far from where we were staying. $10 each, senior rate, as Tuesday is senior day! 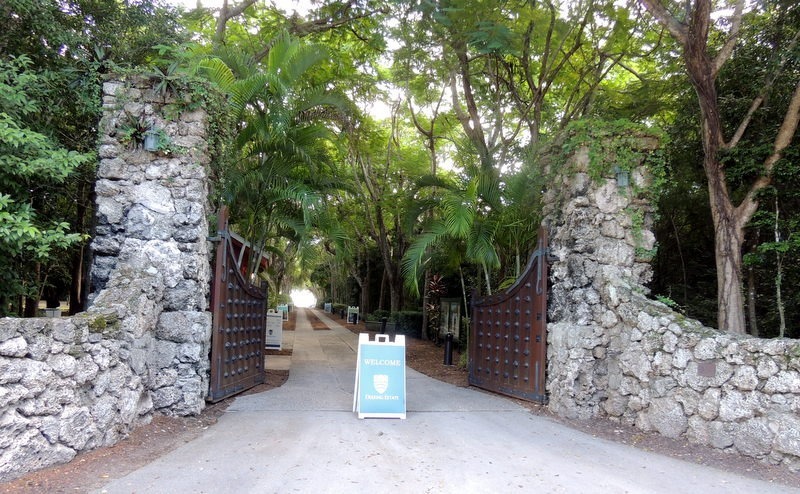 “ Located along the edge of Biscayne Bay, the 444-acre Deering Estate is an environmental, archaeological and historic preserve that offers unique opportunities to experience Florida’s natural resources. 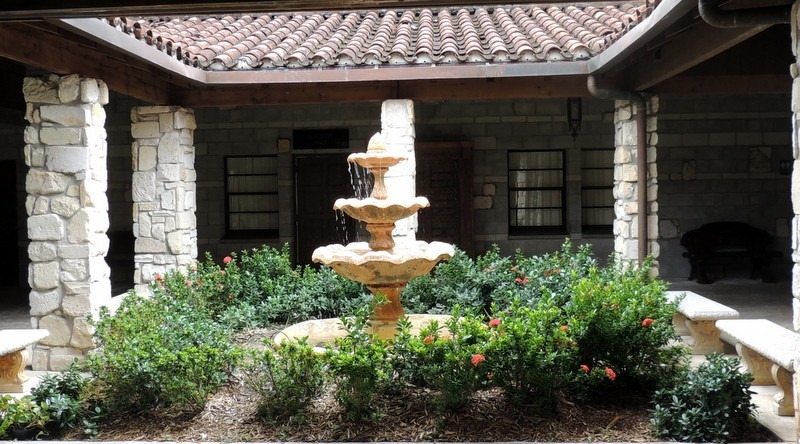 Visitors enjoy daily tours of historic homes, hikes through the lush natural areas, opportunities to examine fossils and tools left behind by pre-historic humans, and much more. 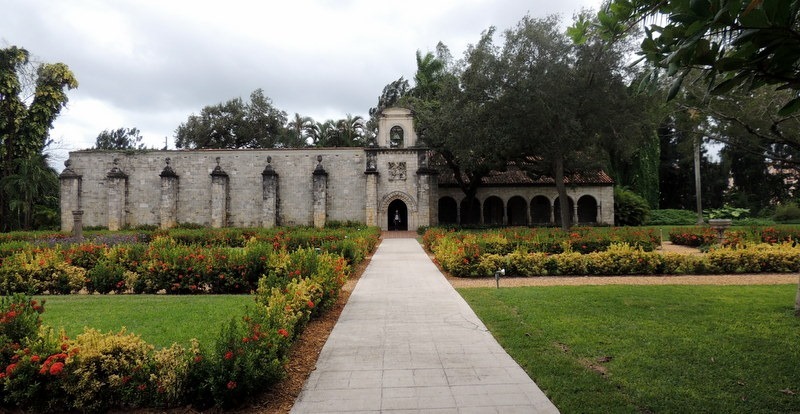 The Deering Estate is a cultural and educational facility that offers classes and programs for children and adults, as well as rental space for special social functions. 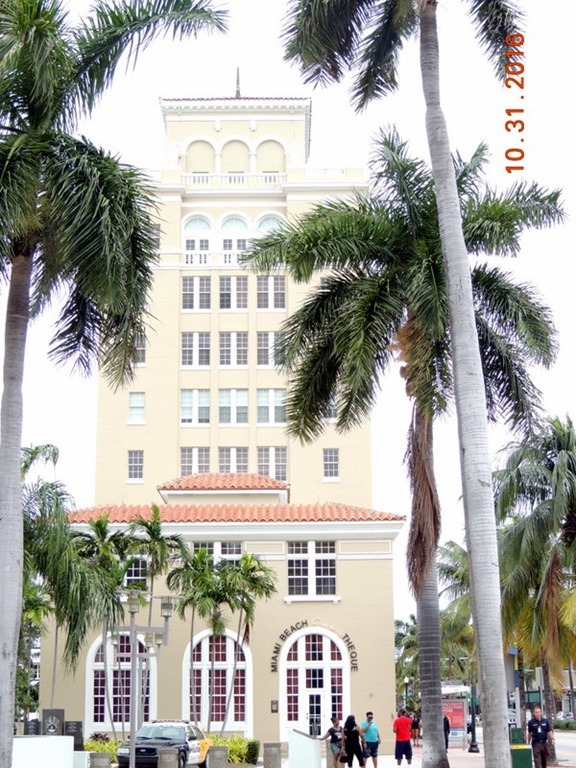 The Estate is part of the Miami-Dade County Parks, Recreation and Open Spaces Department, which manages the property on behalf of the State of Florida. 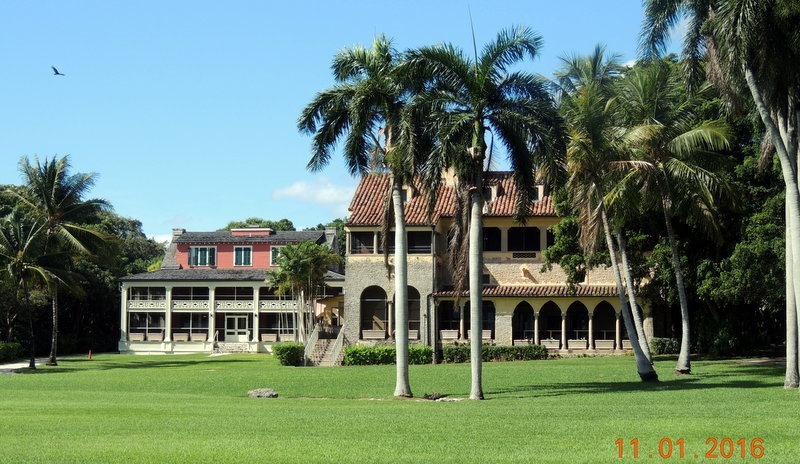 The Deering Estate celebrates 30 years of being on the National Register of Historic Places. “ from the website. 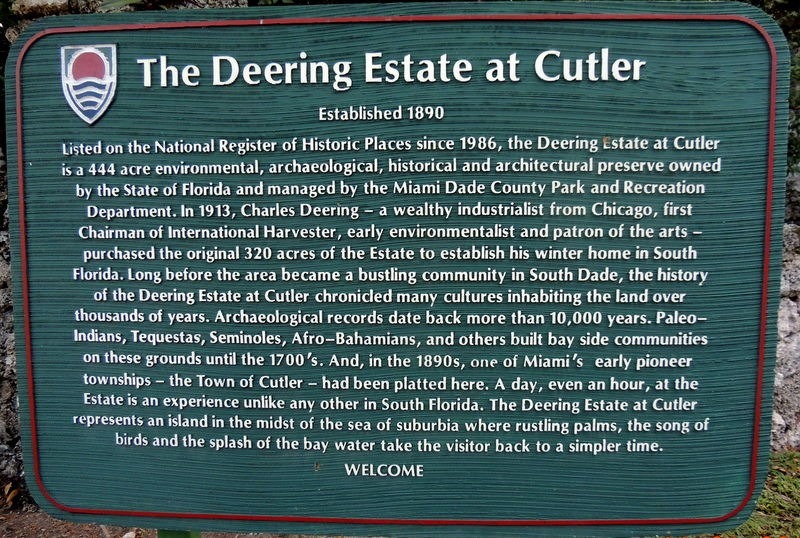 “Deering lived on the 444 acres (1.80 km2) property for five years, from 1922 to 1927. The property consists of a three story wooden house built in 1900, known as the Richmond Cottage, and a three story stone mansion. Other buildings were also built on the property to serve as auxiliary buildings to the estate. 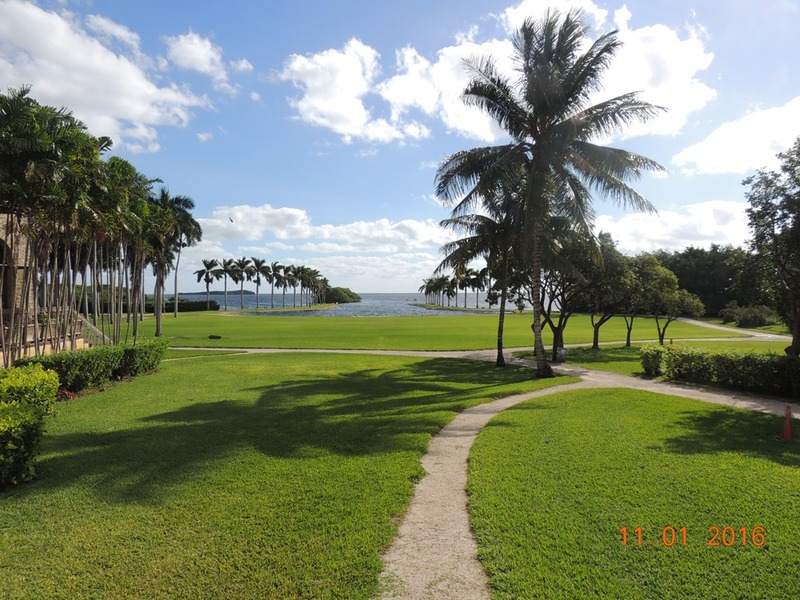 Charles Deering Estate is located in the Cutler neighborhood of Palmetto Bay, Florida. The grounds include what is thought to be the largest virgin coastal tropical hardwood hammock in the continental United States. 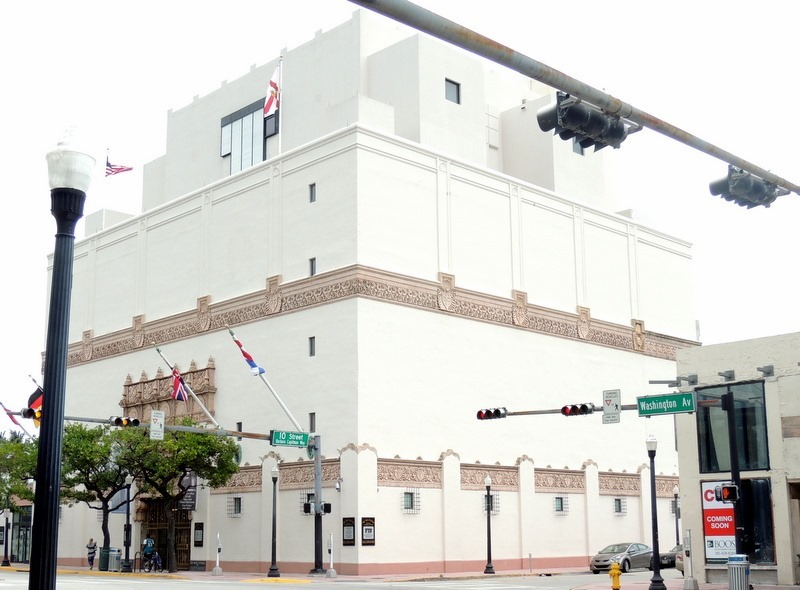 The estate was acquired by the state of Florida in 1985. 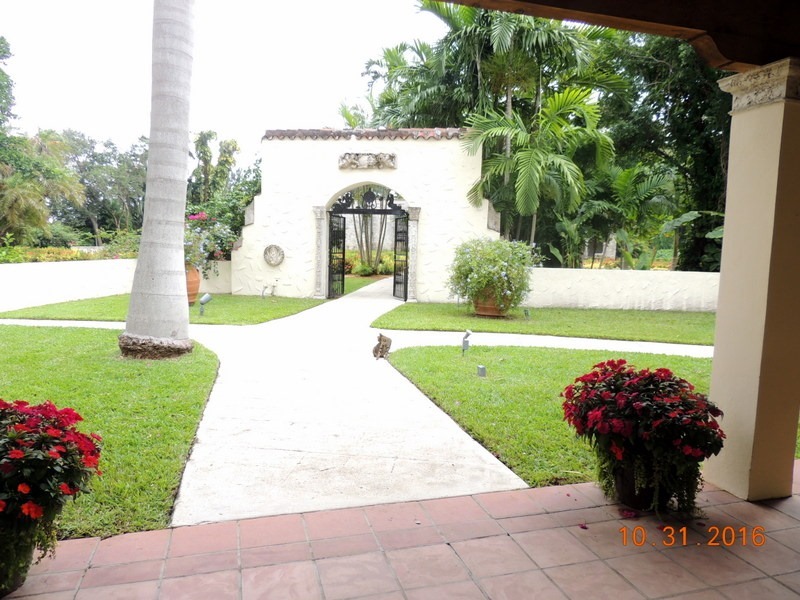 The house and grounds were featured several times in the 1980s TV series Miami Vice and it was the starting line for The Amazing Race All-Stars in 2007. On the left is the Richmond House and on the right is the Deering Mansion. They are connected by a walkway. The Richmond house was almost lost during Hurricane Andrew. Basically, the only thing left sanding was the fireplace/chimney, which you cannot see, as it is on the right. The one on the left that you can see fell. Hurricane Andrew had a 17 ft. tidal surge, so it basically wiped out the wooden structure. The buildings are on a slight hill, which keeps most storms from damaging the buildings. Other than hurricanes, the buildings seem to weather the storms. The state was worried that they would lose their Historical Designation, so they used as much of the materials that they could to re-build the structure, so the floors are original as is much of the masonry. We sat on the Richmond House porch until the 10:30 tour, enjoying the awesome breeze. It was beautiful here! Our guide, Anna arrived and we had a private tour, as we were the only people there! I was not allowed to take pictures in the building. But after Anna left us in the basement, I snuck this picture. Ssssh, don’t tell on me! LOL !! We thought this vault was fascinating! 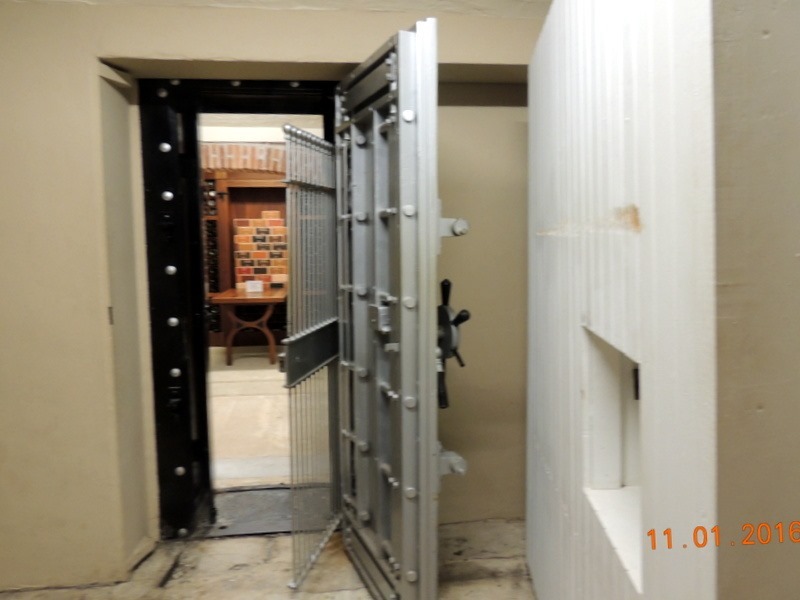 This was a vault which was found in the 1980’s, after the estate was purchased by the state! There are four doors. The first is on the right. This was a swinging wooden door, with a hole in it where, when you pushed on it, opened the swinging door. It hid everything! No one realized that there was a vault behind it. The second door is the vault door, which had two mechanisms that no one could open. Then door number three is the see through gate, which was also locked, then the final door is the black you see on the left, that was also locked! So the state found this vault , after they purchased the estate from the family in 1985. They contacted the family who were appalled. They did not know about it, and were of course terrified that they had sold something very valuable, that they did not know about! The estate could not be sold or of donated until the last direct descendent died. That was one of Deering’s daughters, who died in 1984. So the state had to find a safe cracker to open the vault. They found an internationally known safe cracker who agreed to open the vault. It took him 3 days. This was after they had tried everyone else, and no ‘honest’ locksmith was able to open the vault. They found a mess. They took pictures of what they found. You can see bottles of wine in the shelves that the state built. During hurricanes in the 1940’s, which damaged the house, the vault had flooded and most of the bottles had fallen to the floor. There where thousands of bottles of wine, all ruined. The state made the shelves for some of the wine bottles. The rest are in storage elsewhere. Back out front, note the walkway which is horizontal. That is the site of the original Native American trail that the Indians would use to travel through the area. When Deering bought the land, he put up a wall to keep out people. When that did not work, he imported alligators to scare people off. Just past the trail was the original site of where the land ended. Deering wanted boats to be able to come into the the land. So he dredged the area you can see, using the fill dirt to extend the land. Biscayne Bay is very shallow in this area, and this was to allow boats to land. Below is the back of the houses. 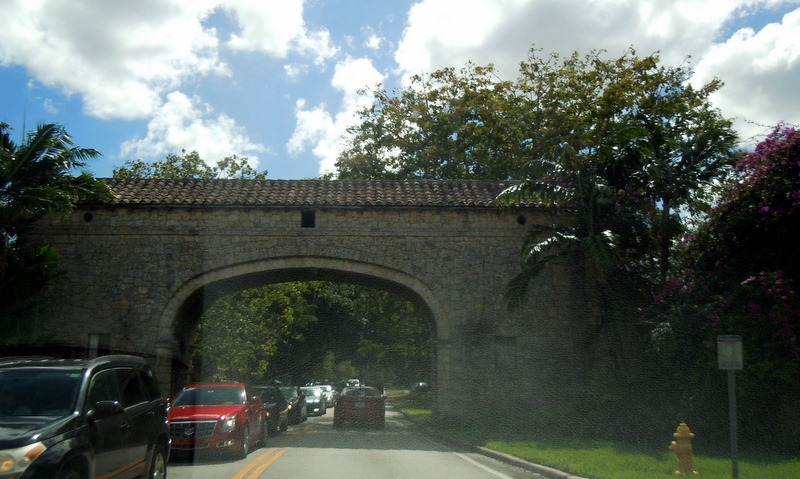 We left the Deering Estate and drove north on Old Cutler Road. What a fantastic road! It was strikingly beautiful, along the estates that line the bay, under a canopy’s of trees. Awesome! 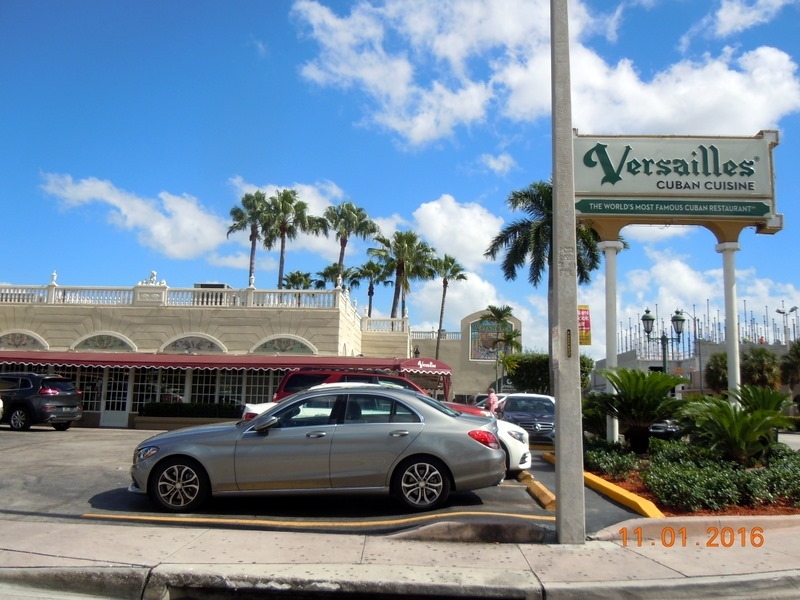 We drove through Coral Gables, to Versailles Restaurant. This was in both of our guide books, as a place to eat. 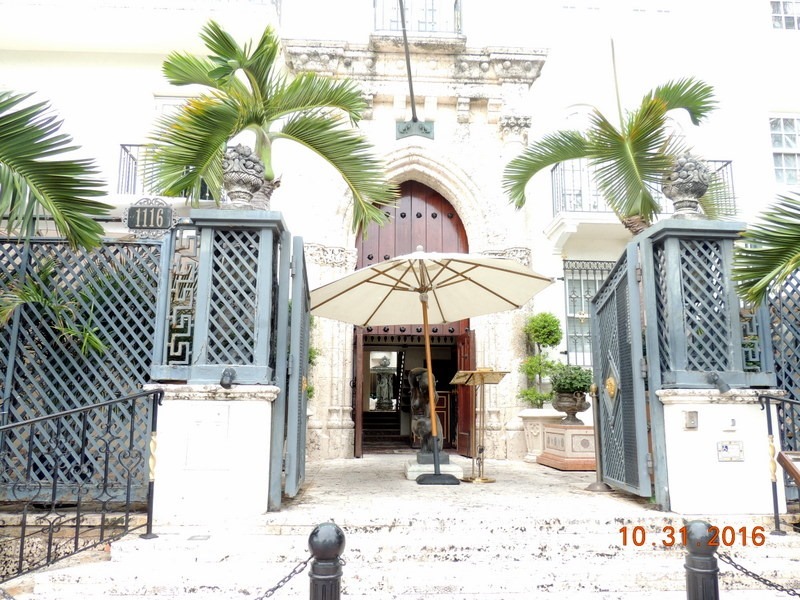 It is an authentic Cuban restaurant, where there seemed to be a lot of Cubans eating. We had a delicious meal! Bob had the pork medallions, with white rice, plantains and black beans. I had the slow cooked pork, shredded, with mixed rice and black beans and fried yucca. The food was inexpensive and terrific. 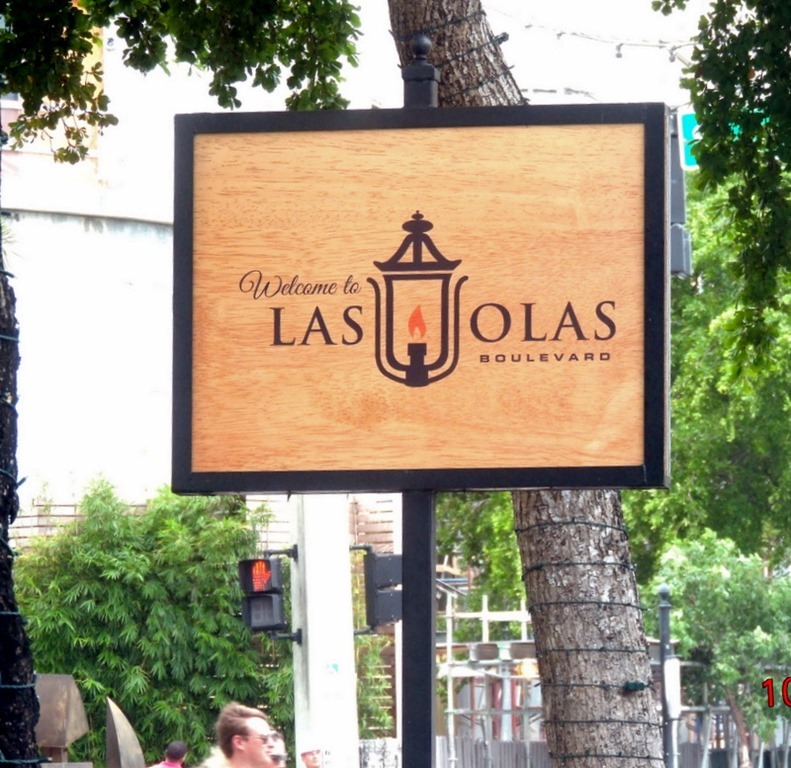 We left and drove back through Coral Gables. Below is one of the entrances. 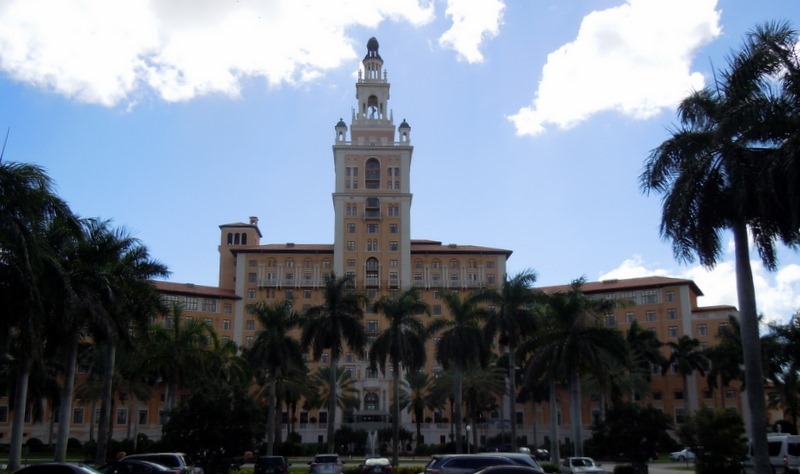 We went to The Biltmore Hotel. This is not on the water, surprisingly. Note in the spire, you can see the circular staircase. We left and drove out to Key Biscayne and Virginia Key. We were trying to get to the Lighthouse, but it was in a state park. 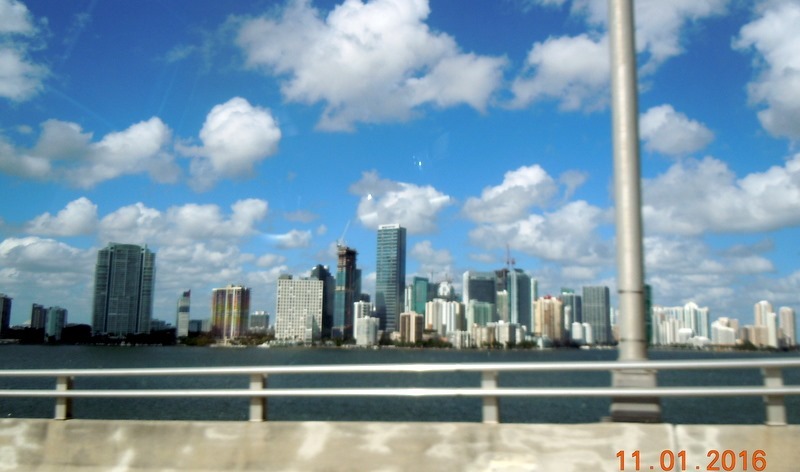 We drove back across the causeway, where the views of downtown Miami are spectacular. .
We returned home through more heavy traffic and insane drivers! Wednesday- We had a 10:30 vet appointment at Banfields, in a Petsmart, for Roxie’s senior physical and blood work. Also, both of them needed their Bortatella vaccinations, so Karlie had to have a minimal physical also. They had both been itching like crazy. We had checked to see if they had fleas, but did not find any. They get Frontline each month, so they do not normally have fleas. The Vet found them though! They were both infested, even with the Frontline. So I quickly called the Petco in Homestead and set up a ‘flea dip’ for each of them. That was closer to the MH. We stopped at Lowe’s and picked up ‘flea bombs’ and ran back to the MH. We worked quickly at getting the MH set up to bomb, then put the dogs back in the car and Bob got the 2 bombs started. We left, taking the dogs to the Petco and dropping them off. We went to lunch at a Mexican Restaurant, and it was really authentic as it was full of Mexicans. We had a nice lunch, nothing inspiring, but okay. We left and went to Walmart. By now it was the two hours that the bomb had to be in place, so we ran back to the MH. On the way, we are driving along on a two lane road, and over the double yellow line, a pick up truck decides to pass us, even though I was traveling at 5 miles over the speed limit. The poor lady in the car coming towards us had to go into the grass. I slammed on the brake to give him room to get in in front of me, averting an accident. The guy never even slowed down, then went up to the corner and made an illegal left turn! We made it back alive to the MH, and opened the windows to air it out for the required 1 hour. We quickly put the refrigerator food away and ran back to Petco to pick up the dogs. We returned to the MH and while Bob walked the dogs, I wiped down the counters and washed the floor, and vacuumed. .
We left to go to Costco for gas and to eat dinner at the Crepe Café. On the way, at a 4 way stop, a guy on a motorcycle, turned in front of me, almost clipping the guy whose turn it was to go straight. That was two almost accidents in one day! We are so ready to leave the insanity of Miami! We returned to the MH, washed the sheets, quilt, and blanket to make sure there were no fleas, and relaxed after a crazy day! Thursday- Moving day! We left around 11 AM to head south to the Keys! I had not noticed that the gal made an error on our reservation at the Encore Park and we were to arrive on the 4th. Bob picked it up earlier this week, and we had quickly made a reservation for one night at the Elks Lodge in Islamadora. As we were driving down Bob’s cell phone rang. It was Patty, the Camphost. She was asking how far we were from her. We were only about 8 miles away. She said that there was construction in front of the Lodge, and that she would have to run to the front of the Lodge to make sure we could get in. So the first place we found that we could pull over, we did and disconnected the car. Patty called back and said she had the workers move their cars, and to come ahead. I drove the car and raced there, while Bob continued in the MH. When I arrived, I jumped out of the car and stood on the side of the road so that Bob could find the Lodge and turn in between the trucks. We parked the MH and set up. $40 for 50 amp and water. There is no dump. The people who stay here all winter, pay about $40 every two weeks to be pumped out. Wow, that can get pricey! But the view is so worth it! I ran down the road a couple of miles to a Subway. It was National Sandwich Day at Subway, and it was buy one, get one free, with the money donated to the hungry in the country. So we each had a sub for lunch. After we ate, I went and had a pedicure. We went to dinner at the Lodge. Bob had a Guinness, as it was also drink a Stout Day, and I had a Panama Breeze, which was coconut rum, pineapple juice and cranberry juice. It was very good! Dinner was a very good meatloaf, with mash potatoes and green beans. Half of each came home as leftovers. We sat outside and watched the sunset, talking with the couple in the 5th wheel next to us, from Oregon. They are traveling the east coast and then heading back home for the holidays. Friday- This is the view from in front of the MH at the Elks Lodge in Islamadora. We left around 11 again, after spending some time sitting out on the pier, then talking to Patty. Since there was the construction at the entrance, it took us a while to get out. Bob drove the MH and I drove the car, since we could not hook up and get out of the Lodge parking lot. I had to stand out front, as there was a beer delivery truck that was blocking the view for Bob to be able to see to turn onto the highway. 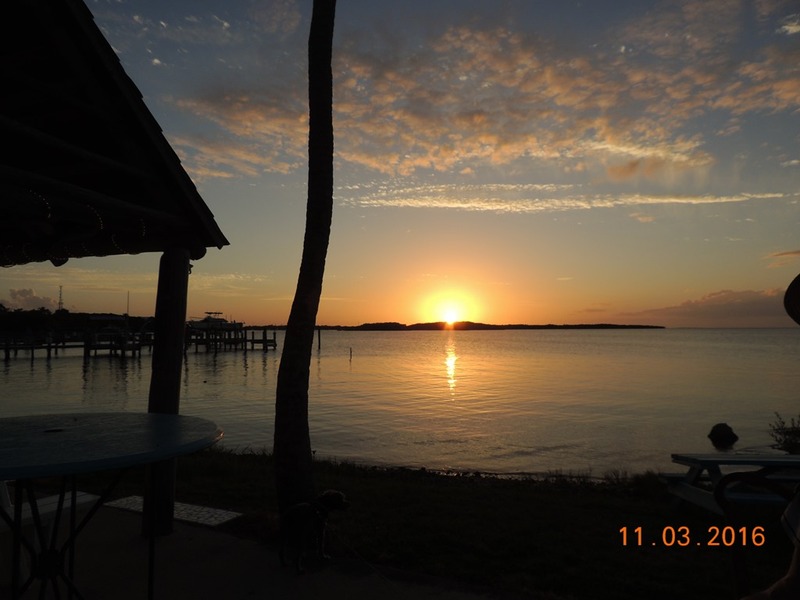 We drove about 50 miles south to Ohio Key, and entered the Sunshine Key RV Resort. This is an Encore Park and we have a special, which we had paid for in January. It is half price, at about $27 per day. FHU 50 amp, plus we pay extra for the electric. We went to site 4, but the sewer was to the front and we could not stay there, so the staff moved us to site 295. We pulled in, ate lunch and set up. We are staying for 30 days, which is why we have to pay extra for electric, which we also do in Arizona! We are two RV’s from the water and can see it out our front window. 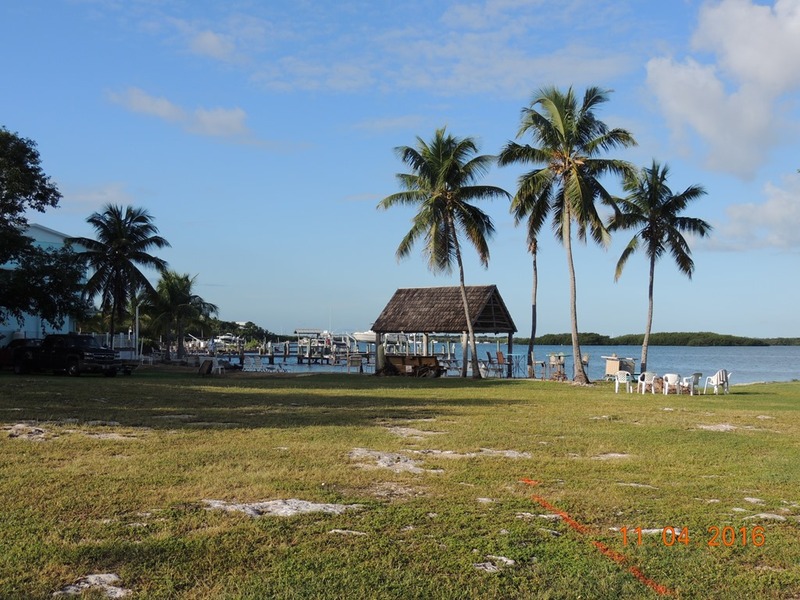 The RV park takes up the entire bay side of the Key. There is the Oversea Hwy, then bushes, then the ocean across the road. We are still in flea mode, so we vacuum every day! We sat outside, enjoying the beautiful weather, read our books, ate dinner and walked over to the dock to watch the sunset. Not as spectacular as last evening, due to Baja Honda State Park, just to our south.